Seiko Astron GPS Solar World-Time. The Novak Djokovic Limited Edition. Novak and the new Astron GPS Solar watch that bears his name. Astron GPS Solar. The perfect watch for the best player in the world. Since the beginning of 2014, when he selected Seiko as his watch partner, Novak Djokovic has travelled the globe in pursuit of ever greater tennis glory, and what a journey it has been! Today, Novak is not only the number one tennis player in the world, but, with his win at Roland Garros in June of this year, he became one of only eight players in the history of the game to have achieved a Career Grand Slam. Over this period, Novak has won an astonishing 25 titles in ten countries on four continents. Accompanying Novak throughout this grueling schedule has been his Seiko Astron GPS Solar watch. International travel is never easy, but, with Astron GPS Solar, Novak can adjust to each new time zone with a single touch of a button. Using just the power of light, Astron GPS Solar connects to the GPS network and automatically adjusts, at the touch of a button, to every time zone on earth, showing the time with a precision of one second every 100,000 years. The new Astron GPS Solar World-Time. Less is more. Now, Novak has a new Astron GPS Solar watch that incorporates caliber 8X22, a notable advance in Seiko’s GPS Solar technology. The case is slimmer than any other GPS Solar watch, even slimmer than all other Astron models (the depth is just 12.4mm compared to 13.3mm in the other 8X series). The dial is simple, with all the indicators in one small sub-dial, giving the watch an understated look and perfect legibility. The Astron GPS Solar World-Time offers everything essential and nothing else. Truly, less is more. As of Aug 1, 2016. Based on Seiko's research. The Novak Djokovic Limited Edition. The best of Astron for the best player in the world. Novak’s signature and individual serial number. The new Novak Djokovic Limited Edition has a unique design that reflects both Novak’s taste and the uniqueness of the new Astron caliber. The dial is a dark shade of mother-of-pearl, which, in combination with the black crocodile leather strap and the rose- gold color case, gives the watch a powerful yet refined appeal, combining both elegance and sport. 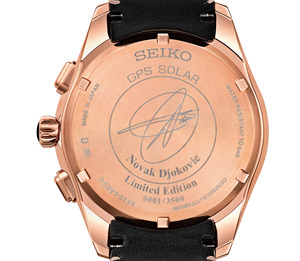 Each watch in this limited edition carries Novak’s signature on the case back and is accompanied by a card carrying a personal message from Novak. Every watch has its own individual serial number and is offered in a special presentation box. Just 3,500 will ever be made. The edition will be released in November and presented at the Seiko Boutiques and other leading Seiko retail outlets worldwide.